"It has been our pleasure on a number of occasions to deal with John & Evelyn. We have always found their Company to be efficient, on time, competitive and the containers arriving exactly as they had been described. They have always gone the extra mile to facilitate a mutual benefical deal. We have no hesitation in recommending them"
Triple Eight offers the option of customising our standard 20' containers supplied from our nationwide depots. 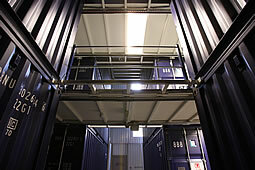 Popularly we offer 4 fitted security doors in the side of a container with 3 fitted internal partitions. This makes for a useful multi-compartment storage unit with full ventilation. We also make site offices and conversions to your specifications. We would normally arrange for our engineers to come onto your site and custom make the conversion to your demands. Made from our standard 20's all coversions are factory painted in our fleet colour, dark cobalt blue. Of course you can choose a different colour to suit your use. As with all our other containers, you can stack our custom converted containers enabling your smaller customers acces from on top of an existing line of containers below.